The implant procedure usually takes place in three steps. Firstly, a screw is secured to the patient’s jawbone, with the top protruding just above the surface of the gum. This is then left to heal so that the bone and gum tissue can fuse to the implant in a process called osseointergration. In the second procedure a abutment is attached to the screw which will eventually allow the crown to be attached.Patients who have jawbones and gums which are strong, will particularly benefit from a dental implant. A good standard of oral hygiene is needed to maintain the implant but the permanency it provides really sets it apart from other dental substitutes. Unlike other restorations, a dental implant will last a whole lifetime if properly cared for. Although the initial cost may be slightly more than other treatments, you need to bear in mind that once you have had implant surgery you are unlikely to need to spend any further money on future replacements. If you are suffering from a missing tooth, see a dentist and ask about having a dental implant fitted to bring the smile back to your face. Call 177-6450704 for an appointment with Dr Goma. At The Himachal Dental located in Shimla, we pride ourselves in the fact that we combine High technology with High touch. Our team of dental professionals aim to make your visit to our dental office in Shimla Twp. the most positive experience at a dental office as possible. With a light hearted, compassionate environment many of our dental patients say what a great place this is to even visit. How then do we incorporate our dental technology with the gentle touch? That is easy-We use the technology as a tool and not an excuse to ignore our dental patients. * We are a paperless dental office so this means that any forms are sent to you online to be filled out in the privacy of your own home so that when you arrive at the dental office you will only need to review the information you filled out and sign off on our tablet PC. This is convenient when you have the time and have access to your medical and dental information. * Digital x rays and panoramic x rays. With the use of digital x rays your exposure to radiation is decreased by 50-60%. The image appears on our screen within 4 seconds of exposure. If a different view is needed there is no need to wait which is common with x ray film. This also makes us a “green dental office” since there are no harmful chemicals disposed of and used. * Electric dental hand pieces are used for precise control of the drill and is quieter than the air driven drills used by many dentists in the Shimla area. * Digital photos of both your smile and mouth make communication and understanding much easier which take the guess work out of it. These can also be emailed to you for your own use. * Computer based educational systems are used to allow you the dental patient to have a better understanding of the procedures that are recommended to you. These are only a few of the unique high technology tools we use for our dental patients in the Shimla Township. For more information please visit our website at www.himachaldental.com or call 177-6450704. India has one of the highest incidence of Oral cancer in the world. The high incidence of oral cancer and oral pre-cancerous lesions in India has long been linked with the habit of betel quid chewing incorporating tobacco.It is the sixth most common cancer reported globally with an annual incidence of over 300,000 cases, of which 62% arise in developing countries.There is a significant difference in the incidence of oral cancer in different regions of the world. The age-adjusted rates of oral cancer vary from over 20 per 100,000 population in India, to 10 per 100,000 in the U.S., and less than 2 per 100,000 in the Middle East. In comparison with the U.S. population, where oral cavity cancer represents only about 3% of malignancies, it accounts for over 30% of all cancers in India. The variation in incidence and pattern of oral cancer is due to regional differences in the prevalence of risk factors. But as oral cancer has well-defined risk factors, these may be modified – giving real hope for primary prevention. Oral cancer will usually first manifest itself as a sore or growth that won’t go away naturally. Oral cancer, which includes cancer of any part of the mouth or throat such as lips, cheek, hard and soft palates and tongue can be life threatening if not diagnosed and treated early.Men are twice as likely as women to get oral cancer with men over the age of 50 being particularly at risk. Factors that increase the risk of oral cancer include smoking, which can increase your chance of oral cancer by as much as 600 percent. Excessive consumption of alcohol can also increase your chances by a similar degree.Other factors that can increase the risk of oral cancer include excessive exposure to sunlight and a family history of cancer. People who use smokeless tobacco products such as snuff, dip or chewing tobacco are a massive 50 times more likely to develop cancer of the cheek, lips or tongue. Although it is important to note that a quarter of people who contract oral cancer do not use tobacco products and only drink alcohol in moderation. Despite the fact that the oral cavity is accessible for visual examination, and that oral cancers and premalignant lesions have well-defined clinical diagnostic features, oral cancers are typically detected in their advanced stages. In fact, in India, 60-80% of patients present with advanced disease as compared to 40% in developed countries. Consistent with patients presenting for medical care with more advanced disease in India compared with developed countries, overall survival is also reduced. Early detection would not only improve the cure rate, but it would also lower the cost and morbidity associated with treatment. The symptoms or oral cancer include: unexplained bleeding in the mouth; the development of white or red patches in the mouth; difficulty chewing speaking or swallowing; swelling, lumps or eroded areas in the mouth; dramatic weight loss.These are only some of the symptoms so it is always best to consult your dentist if you have any concerns. Your dentist can conduct an oral cancer screening exam as part of your regular dental check-up and can perform a brush biopsy of any suspicious looking sores in the mouth. This test is completely painless and involves taking a small sample of tissue for analysis. Your dentist will also be able to check for any tissue changes in your oral cavity, neck and head. 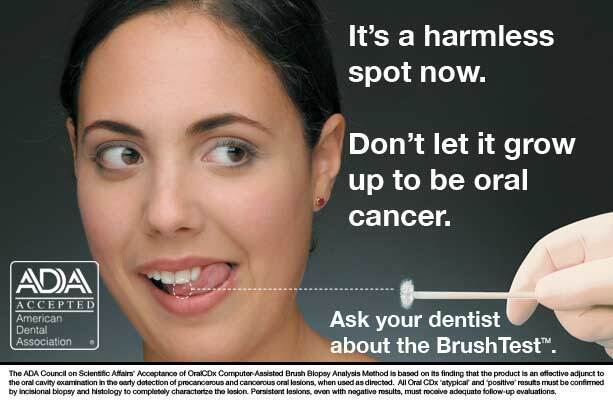 If oral cancer is detected in its early stages patients have a greater than 80 percent chance of successful treatment. There is still much to be done. Oral cancer remains a major health problem in India, and only dedicated, sustained efforts towards early detection and prevention will reduce the burden of this disease.If you need any information please call us at 177-6450704. There are many dental problems that can spoil the appearance of the teeth and make people ashamed of their smiles. In some cases this can be the source of real emotional problems that affects self-confidence and self-esteem but there are ways to improve your smile with various cosmetic dentistry treatments. As you may have seen on one of the many TV makeover shows on our screens in recent years, porcelain veneers are capable of completely transforming the teeth and creating stunning healthy looking smiles. These are thin ceramic shells that fit over the top of the existing teeth restoring the size, color and shape of damaged teeth. This damage could have occurred as the result of discoloration, worn enamel or even structural damage to the teeth. The veneers are made of porcelain and will be specially designed to compliment your mouth and smile. Your dentist will construct the veneers according to dental mould or digital x-rays taken at an earlier appointment. Modern fabrication techniques have radically shortened the time it takes to make veneers and the finished product is now of a superior quality. In the past, porcelain veneers took several weeks to manufacture in the lab after several appointments to measure and design had been carried out. This involved lengthy and uncomfortable dental moulds and rounds of x-rays, but in recent years new technology called Cerec has revolutionised the way that veneers are designed and manufacturedCerec utilises CAD/CAM technology, meaning computer aided design, computer aided manufacture. With the aid of new technology such as digital x-rays and three-dimensional imaging the dentist is now able to design the veneers on a computer screen before instructing a computer to sculpt the veneers from specially chosen porcelain. This has drastically reduced the time you will need to spend in the surgery and made treatment a lot more pleasant. The veneers are cemented in place using dental bonding, a resin substance that is very hard wearing, adding another layer of protection to the teeth. The ceramic itself is also very tough and will protect the teeth from further damage. You may have seen the incredible effects possible using the latest veneer techniques on one of the many TV makeover shows that populate our screens at the moment. Porcelain is such a good choice for veneers as it very closely resembles actual tooth enamel even to the point of being slightly transparent.These look and feel just like real teeth and with the right care and attention will last up to twenty years before they need replacing. Not only will they look great but they will also protect the teeth from external damage by plaque and bacteria.This means that not only will your teeth look and feel great, but they will also look very realistic. Find out more about veneers at your dentist the next time you go for a check up appointment. The emergence of antibiotic resistant bacteria is becoming a major problem in the fight against hospital-related infections. Researchers from New York and Albany in the United States have now reported the successful testing of a new nanoscale coating that can be used for surgical equipment or hospital walls and kills even super-resistant bugs like Methicillin-resistant Staphylococcus aureus (MRSA) within 20 minutes of contact. MRSA is a bacteria-strain usually found on the skin and sometimes nasal passages of healthy people from where it can find its way into the body through cuts or healthcare-related equipment like catheters and breathing tubes. Infections caused by MRSA are difficult to treat because they do not respond to antibiotics used to treat staph infections such as penicillin or cephalosporin. In countries like the UK, more than 1,000 patients die of MRSA-related infections per year. The new coating, which is based on a natural enzyme called lysostaphin, can be used with any type of surface furnishes the researchers said. In a field test, they mixed it with ordinary latex house paint, which was used to paint a number of walls in the Albany Medical College. They found that lysostaphin, which is only toxic to MRSA, works by first attaching itself to the bacterial cell wall and then kills it by slicing it open. Kane added that the coating has a dry storage shelf life of up to six months and can be washed repeatedly without loosing effectiveness.